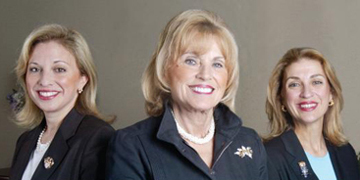 FAMILY MATTERS: The Gould Group of Wells Fargo Advisors, LLC is headed by the mother-and-daughters trio (from left): Georgeanne Gould-Moss, Audrey Gould, and Ellen Gould-Baber. When Audrey Gould entered the financial services industry almost 30 years ago, she had no idea that she would end up heading a wealth management group in partnership with her two daughters. A part of Wells Fargo Advisors, LLC, the Gould Group provides investment advice and financial management services to clients local, national, and international. Audreys daughter Georgeanne Gould-Moss joined the Gould Group as a partner 15 years ago, with daughter Ellen Gould-Baber coming aboard 11 years ago. A longtime resident of Princeton, Audrey moved to town over four decades ago with her husband, and both Ellen and Georgeanne grew up here and went through the Princeton school system. Having gone elsewhere to study and work, the daughters now live in Princeton with their own families. The trios office is on Nassau Street. Here, the three ladies talk about what it takes to run a successful family business, the challenges of the current fiscal climate, and the joys of working together. Audrey: There are a good many fathers and sons on Wall Street, but there are almost no mothers and daughters. Georgeanne: Its a great thing working with your mother and your sister, because when you leave the office you know youre leaving it in good hands. Were all on the same wavelength regarding investing and our thoughts on the markets. I dont think there have been really any discrepancies in our thinking. Mom has been following the markets since she was a little girl. Her uncle had a seat on the New York Stock Exchange. We all bring different components [to the business]. Weve never been opposed when it comes to how to deal with a client, even once. We view things the same. Ellen: We know each other so well that its an organic process. Well be having dinner at Moms house and well have an idea. Some news will break and well get together and discuss the impact of that news on the markets. It is really is a free flow of information. Were so close to one another, and its not just geographically in the office. theyd already had successful careers. G: Before I went to law school, I worked for Governor Mario Cuomo. I worked as an intern for his speechwriter and then I worked for his legal counsel in between law school and college. I worked at a law firm after law school for a brief amount of time because I didnt really enjoy it and then I went in-house at an investment banking firm. E: I started in the early 80s working for my mother and left shortly thereafter and worked for a number of different firms. I started out training sales assistants and then I moved up to training financial advisors, and then to training management and partners on Wall Street. and then when we moved back here, I joined Mom and Georgie full time. A: I once had a client who came in  she was an elderly woman  and she had a shopping bag. When she opened it up, she placed on my desk stock certificates where you would not believe some of the dates! There were a tremendous number. Her grandfather had told her never to sell anything. Needless to say, some of them were not valid any longer because the companies were no longer trading, but many of them still were. It amounted to several million dollars. I would have never guessed that that would be. But she had been to a lawyer and that lawyer had referred her to us, with the idea that somebody had to take charge. A: There isnt one set way everyone should invest. You really have to know the client. We have corporations [as clients], we have pension plans, we have many individuals. Some are very high net worth individuals, and we have people who dont have a great deal of money. We have young people and we have senior people. G: We have clients who are 100 years old. And there are those who youve known since you started the business 30 years ago. You see whole families. We have people that Mom started with, and now were working with their grandchildren. E: We provide a level of care and communication and client services. People lose spouses, children are born, and we are there through those events to help clients through proper investment recommendations.
. Were long-term perspective people. Some people react too quickly and start selling immediately in a down market. Our main focus is for people to stay calm and to work with them. A: Everybody lost money in the crisis. We didnt have as severe a downturn as some, because we have balanced portfolios. Lots of bonds, tax bonds, corporate bonds. E: It was such an emotional time, for everyone. There was a great deal of fear and people were very cautious. But I think to be reactive in that kind of a situation doesnt serve peoples long-term interests. G: I have confidence in the United States and its government. Its not going to be a perfect upswing; its not going to go in a straight line, but Im optimistic about the future. E: Theres nothing that works like experience. Weve been in this business a long time and weve been through some very rough times. Not just in 2008.
. Thats one of the beauties of growing older: you can garner that experience and share it.